We liked the LTC Rabbit Scrypt mining pool as soon as we have tried it for the first time a few weeks ago when DOGE was in its peak in terms of higher profitability compared to LTC. The pool has been running stable and reliable and had a nice altcoin bonus on top of the earnings if directly mining for LTC, so a perfect choice for a backup pool that will still ensure higher profitability than directly mining for Litecoins. However lately there haven’t been any extra altcoin bonus been given by the pool and it was mining LTC most of the time anyway. The reason for that was that DOGE was not so profitable to mine anymore and the other alternative cryptos such as WDC or MEC did not perform any better than directly mining for LTC. It seems that the pool has added a few more newer and supposedly more profitable alternative cryptos including the lately very popular AUR crypto, so that it can start giving away extra altcoin bonuses again. We still have the pool as our backup mining pool and our primary one for the moment remains ScryptGuild, so check that one as well if you still haven’t. LTC Rabbit is an interesting pool for mining scrypt-based crypto coins that does the automatic profitability switching between LTC and a few other crypto currencies for you such as DOGE. What makes this pool different is that it does everything for you automatically and you end up being payed directly in Litecoin and not many different crypto currencies that you need to send back to an exchange and trade them. 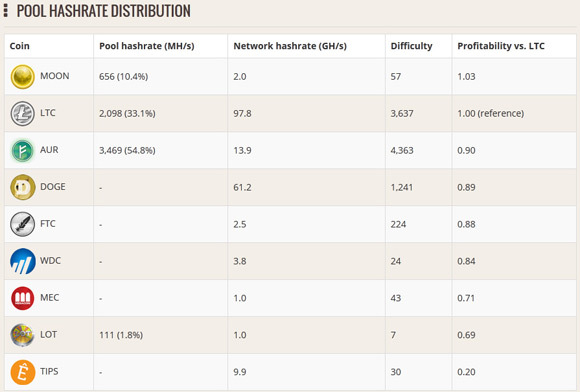 This pool solves the problem of mining many scrypt cryptos like in Multipool for example, then moving them to an exchange such as Cryptsy, and selling them either automatically or by hand. This method may be a bit more profitable, but is also more time consuming and riskier as the price may drastically change while you wait for your crypto currency to appear on the exchange. LTC Rabbit does everything for you and you end up being paid in LTC directly, regardless of the crypto currency being mined currently, and though this method may be a bit less profitable, it is much easier and safer, especially on the miners that are new and are still getting the hang of things. LTC Rabbit has a 2% pool fee, and uses PPS (Pay Per Share) payment system with payments being distributed to users every hour respective to the submitted shares by their miners. You get paid for the LTC mining you would normally do in an Litecoin only mining pool plus PPS altcoin bonus on top of your regular earnings, and it all comes in the form on LTC available in your account. The pool has stratum servers in Europe, USA, Asia and Australia, and they are DDoS protected and stable. There is no minimum payout limit, so you can do manual cash out a any time you wish provided that you are ready to pay a 0.002 LTC transaction fee. We have been testing this pool for a while now and are quite satisfied with the results we are getting and it has already replaced our LTC mining pool as a default option instead of having it as a backup. What we would recommend is to give it a try and see if you would also like the ease of use and the profit you get from the pool that is doing everything automatically for you.